It’s not just cans – bottle tops are also made of recyclable aluminium. We’re all familiar with drinks can recycling. In fact, the rate for recycling aluminium cans in 2016 was 54%. This figure is set to rise further as recycling becomes the norm not just at home, but at work and ‘on the go’ as well. Drinks cans – soft drinks/beer cans, please make sure they are empty. Bottle tops – aluminium screw caps, found on bottles of wines, spirits and cooking ingredients: Please screw them back on the empty bottle before recycling at a bring bank. You can find your nearest bring bank by click here. Each recovery operator now collects both of these materials for recycling. Some other types of aluminium packaging are not always collected by recovery operators, this includes coffee capsules (e.g. Nespresso). Alupro has supported Nespresso who have established their own recycling system. Find out more here. All aluminium is endlessly recyclable but not all types can be collected from the kerbside. 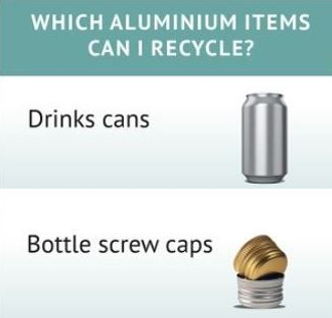 Please take any other aluminium items to be recycled at your local civic amenity site (‘the tip’) such as aerosols, bikes, garden tools, pots/pans and empty paint tins. Click here to find your local centre.